Asamoah Gyan is a Ghanaian International football player who plays as a striker for Stade Rennais in the French Ligue 1. He was educated at Accra Academy where he played in the school's soccer team. Having signed for Udinese in 2003 from Ghanaian club Liberty Professionals, Gyan would spend two-years on loan at Serie B club Modena primarily to gain experience. Following some excellent displays during the 2006 FIFA World Cup, he attracted interest from Russia. He would return to Udinese at the beginning of 2006, but on 17 February 2007, Udinese pulled out of a deal to sell Gyan in the January transfer window. The then 21-year-old striker was on the verge of signing a three-year deal with Russian Club Lokomotiv Moscow for US$10.5m, the fourth largest in Russian football history. "The striker Udinese targeted to replace me did not sign for them," Gyan told BBC Sport. "I've been told I will now have to stay in Italy for the rest of the season." On 10 August, along with Fabio Quagliarella, Asamoah signed an improved 5-year contract-extension which would keep him at Udinese until 30 June 2012 as a reward of his fine form in the 2007-08 Pre-season. "I have decided to stay here because it is one of the top leagues in the world," Asamoah told BBC Sport. "There is the possibility of me playing regular football here to make me a better player. "I am comfortable with the new deal and I know I can help Udinese achieve great things for the future". Asamoah and Quagliarella marked their contract extensions with a brace each in Udinese’s 7-0 friendly win later that evening. He was linked with a move to Manchester United, Arsenal and A.C. Milan by the Italian media on 29 July 2007 following his impressive Pre-season form, including a hattrick in a friendly against Serie B outfit Spezia on 25 July, before Udinese tied him to the long term deal. Gyan scored ten goals in 2006-07 to help the Stadio Friuli Club to finish in tenth place in Serie A. He got injured during the 2007-08 Season and never played for Udinese again after January 2008. He played in 13 Serie A matches and scored 4 times that season. On July 11, 2008, Asamoah was signed by French Ligue 1 Club Stade Rennais for 4 years on an €8 million transfer fee. Gyan warms up at the African Cup of Nations 2008. Gyan scored the fastest goal of the 2006 FIFA World Cup; a 68-seconds goal, which also happened to be Ghana's first ever goal in the world cup finals, in the World Cup game against the Czech Republic on 17 June 2006 at the RheinEnergieStadion in Cologne, Germany, which set the Black Stars on their way to a thrilling 2-0 victory. He missed a penalty later in the game, and received a yellow card (ruling him out of the final group game) for trying to take the penalty too early. In Ghana's defeat to Brazil in the Round of 16, he was sent off in the 81st minute after collecting his second booking of the match (for diving). He was part of the 2004 Ghana Olympic football squad, who exited in the first round, having finished in third place in Group B after Ghana was tied on 4 points, 0 goal difference and 2-2 Head-to-Head with eventual gold medal winners Italy. Ghana had scored 4 and conceded 4. Gyan scored on his senior International debut for Ghana against Somalia on 19 November 2003 in the 90th minute, after coming on for Isaac Boakye in the 62nd minute in a 2006 FIFA World Cup qualifier, 3 days before he turned 18 years; helping Ghana to win that game. He went on to score four times in seven matches during that successful World Cup qualifying campaign. He has scored 13 times in 27 appearances for Ghana. On January 24, 2008 during the 2008 African Cup of Nations Gyan and his brother Baffour decided to walk out on the Black Stars following criticism after their unconvincing 1-0 win over Namibia. The media learnt the brothers had packed their bags and were ready to leave the team hotel but were persuaded to stay by team-mates. In the 2010 African Cup of Nations, Asamoah Gyan helped a Ghana team, ravaged by injuries to the finals. Gyan scored three out of the four Ghana goals during the tournament. He is the first Ghanaian Player ever to score a goal at the FIFA World Cup Finals. 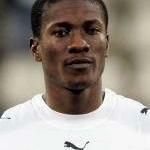 His brother, Baffour Gyan, currently plays in Ghana for Asante Kotoko.